The conference season is in full bloom this spring! But wait, there's more! On Wednesday, I'll join the esteemed Jacques Warren and Jennifer Wilson of Webtrends to talk web analytics and segmentation. We'll discuss all sorts of fun stuff at 1:00pm EDT / 10:00am PDT, click here to join us! One of the pointless arguments you see in the blogosphere, on twitter, and in trade journals, is one where folks debate whether "print is dead". You'll read a quote from a trade journal author saying something like "... nobody told Brand X that print is dead, they just executed a print campaign and plan on doing more ...". And on the other side, you'll read something like "... the advent of the iPad will hasten the demise of print." Both comments are just empty, unactionable sound bytes, right? As you already know, print as it existed in 1995 is completely dead. It's been dead for a decade. Thirty million households have moved beyond print. As you already know, there is a subset of your audience that loves print. To this subset of your audience, print isn't dead, print is the way you shop. Thirty million households rely upon print. So why not simply manage reality as profitably as possible? Why not send your print-based campaigns to those who desire them, why not send nothing to the customers who could care less? This isn't a new concept. It is a concept that doesn't seem to gain the traction necessary to please customers. There are so many obvious and actionable things to focus on, things that deliver more value than the "power of employee blogging". "Which customer is more valuable, a customer buying one item for $300, a customer buying four items for $75 each, or a customer buying four items for $60 each after receiving a 20% off promotion?" These are important facts to know and understand, because they make a difference in how your merchandise your home page, your landing pages, your e-mail campaigns, your catalogs, your paid search activities, you name it! Pay close attention to the merchandise purchased by customers who buy after clicking through an e-mail marketing campaign. Your e-mail merchandising strategy changes when customer behavior changes. If the customer buys the merchandise featured in your e-mail marketing message, you are compelled to focus efforts on the merchandise that sells. If the customer clicks through your e-mail marketing message and buys something else, you are liberated, you get to focus on the merchandise or content that stimulates customer action. The two marketing strategies are polar opposites of each other. Knowing which one to execute is paramount to a viable e-mail marketing strategy. "Kevin, your blog is great, I really appreciate your thoughts. Say, could you provide me with three or four free tips that will get my business moving forward, just a few things that I could implement tomorrow morning that will immediately work? Thanks for the feedback." Let's assume that life works that easily, that there are three or four topics that can immediately improve business, tips that are freely available. What might those tips be? Tip: Page counts are getting smaller. Now that your website is your dominant channel, test how small your catalogs can be. The goal of a catalog is to drive the customer online to buy merchandise, your full assortment is online, so why destroy the planet with 148 pages when you can get away with 80 pages or 64 pages? Tip: The first twenty pages of your catalog mean everything. Why waste time using the first twenty pages as a branding tool? Tip: Measure order starters. Identify the items that cause orders to start. Capitalize on those items by merchandising the first twenty pages of your catalog with them, merchandise your prospect mailings with these items. Tip: Stop sending remail catalogs, create new catalogs instead. You operate in an era where the customer gets information immediately, on demand. You want to send the same catalog you sent five weeks ago? Tip: Stop matching e-mail orders back to catalogs. More than half the time when I analyze the results of mail/holdout tests, e-mail productivity increases when catalogs are not mailed. Just think about the implications of that one for a moment. Tip: Identify the customers who have moved on from old-school catalog marketing, and stop mailing catalogs to them. To these customers, print is dead. Tip: Any catalog brand not executing mail/holdout testing to quantify the true incremental value of a catalog is blindly praying for good catalog performance. Tip: Any catalog brand not executing frequency testing in catalog marketing or e-mail marketing is blindly praying for good catalog performance. Tip: Any catalog brand not thoroughly exploring online customer acquisition opportunities is blindly praying for good performance. Tip: Pay close attention to the relationship between print and search. I mean, pay REALLY close attention to this relationship. Tip: Make knowing the "organic percentage", the percentage of demand that still exists without mailing any catalogs, the number one metric your analytics team measures. Tip: Catalog customers are rural customers. The psychology of your advertising changes when you understand that catalog customers are predominantly rural customers. So, there, those are a few free tips. Apply those to your business, and I'm confident that you will see profit improvements of 10% to 50%. Sound good? And the tips are free, for crying out loud. Just use them! How about joining me in Berlin to attend ECOM? My talk is about ten trends shaping catalog marketing, and in fact, I won't provide ten trends, I'll share at least 27 different strategies and issues that are driving the future of catalog marketing. Click here (German, English) to see the star-studded lineup! I look forward to meeting all of my European readers at ECOM in Berlin next week. My entire career is based on the measurement of ecosystems. When you hire me for a Multichannel Forensics or Online Marketing Simulation or Digital Profile project, you ask me to "tell the story" of "how everything fits together over time". Given how everything fits together, you ask me to find ways to reduce or reallocate your marketing budget. 97% of the measurement audience focuses on the measurement of events. We pretend to measure multi-dimensional events --- the online marketer tries to tie telephone orders to e-commerce orders, in order to properly measure paid search activities --- the catalog marketer tries to tie e-commerce orders to telephone orders, in order to properly measure catalog activities. If we can prove that a series of activities generate a positive outcome, then we can defend additional activities, can't we? The biggest difference between my projects and campaign-based analytics is "purpose". When you use web analytics to measure a campaign, you know whether the campaign worked or not. Your analysis fails to communicate what impact the campaign will have on your business two or three years from now. Your typical Multichannel Forensics or Online Marketing Simulation or Digital Profile project does the opposite. These projects do not consider the impact of specific campaign. Instead, these projects focus on the impact of a family of activities (i.e. search or e-mail marketing) on the future ecosystem of a business. If you double your e-mail marketing frequency, what happens to store sales two years from now? If you stop your paid search program, what happens to e-mail marketing results three years from now? How might social media shoppers evolve differently than traditional catalog shoppers? I have yet to find anybody in the web analytics world who focuses on ecosystems. Web Analytics evolved to measure campaign effectiveness, or event effectiveness, or visit habits. The element of time is not of primary concern in this discipline. Measurement has never been easier, or cheaper. And yet, we're not measuring everything we should be measuring. Too few of us are measuring ecosystems. To many of us are measuring lighting bolts within thunderstorms, events that cannot be replicated, events that do not influence what will happen two days or two years from now. Many of the challenges of modern marketing surround the cost of marketing. One the one end, we have marketing channels that have significant cost associated with them, in large part because there is often a quantifiable return on investment associated with marketing channels. There is a reason it costs you six cents to rent a name for a catalog mailing ... because that is the cost where you make enough money over time to justify the cost. There is a reason that a Super Bowl commercial costs between $2,000,000 and $3,000,000 for thirty seconds ... the size of the audience makes it possible for just one in a thousand viewers to spend $100, allowing the large investment to break-even or even turn a profit if done well across 90,000,000 viewers. The ecosystem has to deliver a return on investment that justifies the cost. Decades of trial and error shape the ecosystem. Conversely, we read all about the world of "free". This is a world that is hard for the cost-based marketer to relate to. In the cost-based world, you craft a message, you identify the audience, you pay for the right to speak to this audience, you push the message at the audience, and you collect a return on your investment. The world of free cannot work in this manner. With no cost to the message, there is infinite competition. And with infinite competition, the message must be of such enormous value, or the message will be drowned out. Non-cost-based marketers defend the concept of "pull", of crafting something of such significant value that the customer wants to pull the value from you. There is a belief that if you give the customer something of such amazing value, the customer will pay you back. My blog, for instance, works on this principal. One could argue that I give away more free information than any of my competitors. In kind, you reward me with 70% of my annual income. The next five years will help determine the balance between cost-based marketing and free marketing. We know how to monetize activities that have a cost associated with them, and in many cases, we're losing this battle (traditional print-based newspapers). We haven't yet figured out how to monetize free activities (i.e. mobile apps, Twitter, blogs) on a mass scale necessary to drive mass adoption. I'd be testing low-cost or no-cost marketing strategies like there is no tomorrow. If you are a person with a history in traditional marketing, you have been trained a certain way. Your worldview requires you to identify a large audience, then find a large audience within the large audience that "shares your values", then you deliver your message to the large audience. The mass marketer uses television, for instance. Segmenting the message requires the mass marketer to speak to a mass audience on a "smaller channel", like a cable channel or a radio station. The digital world is moving in the opposite direction. Take Ning, the social network community where 40,000,000 individuals disperse among a million networks. That's an average of forty individuals per network. A traditional marketer sees these numbers and says, "that can't work". The traditional marketer must make a single message work to a mass audience, the economics of traditional marketing require a mass audience. The digital marketer must accomplish the same objective in an opposite manner. The digital marketer must make small numbers work. The digital marketer finds ways to glue together audiences of 29 individuals, 88 individuals, 1,294 individuals, and 284,003 audiences. Our future requires both disciplines. A cataloger will be able to rent 1,380,439 customers at six cents a pop for the foreseeable future. Companies will be able to create mobile apps that solve problems for smaller audiences. And search will represent a way for a mass audience to act in small ways, all with individual preferences that cannot be lumped together. Our job, of course, is to be good at making big numbers work (big numbers work well when there are big costs involved), and to be good at making small numbers work (small numbers work well when there are small costs involved). For many of us, we're having a hard time wrapping our heads around the concept of making small numbers work. We will have to get better at doing this. Ok, my direct marketing fans, here's my working hypothesis on what has been lost. In 1995, your customer received a catalog. She liked something, so she placed an order. She called a call center, most likely one actually staffed by the company receiving the call. A human being walked the customer through the order process. The really good companies cared about this experience, and made sure they didn't cut costs here, they realized that all of the magic happens when an employee works well with a customer. In 2010, show me where the human connection is? You rent a name from a co-op. You put the catalog in the mailbox. Or maybe you send the customer an e-mail message. The customer goes online, she searches using Google, she maybe chooses a competitor, or she buys from us. The transaction is a cold, humanless one, conducted by a secure server powered by coal from West Virginia. In 2010, the customer doesn't have human connections in the world of e-commerce. But she wants human connections. If she didn't want human connections, Facebook and Twitter wouldn't exist, right? So here's what we lost. E-commerce eliminated the human connections our customers actually liked. Our customers desired human contact, and migrated in large numbers to Facebook or Twitter. And our response to this was to set up a nameless, faceless brand-based presence on Facebook or Twitter where we offered discounts and promotions, thinking the discounts and promotions were what the customer really wanted --- not surprisingly, our customers didn't want a relationship with a brand that offered discounts or promotions. No, our customers wants a relationship with a real human being. If she didn't want this, then 90% of transactions wouldn't happen in stores, would they? My working hypothesis is that the slow decline in catalog marketing isn't so much about print being "old school" as it is about the elimination of human beings and customer service that was facilitated by the transition from the 1-800 number to e-commerce. Human beings, when on their game, are fantastic. They provide love, support, assistance. Websites, when on their game, are cold, lifeless, and efficient. They process transactions, cheaply. By cutting human costs, the brand can give margin back in the form of free shipping. Human loyalty is lost, discount/promo loyalty is gained. Did the p&l improve? This is what we lost. Human connections. Fortunately, we can get this back. Quickly. It's not hard. It simply requires an investment ... in people. As mentioned a hundred times on this blog and on Twitter, across my client base, when customers interact with employees, customer lifetime value improves. Do you want to increase customer lifetime value (otherwise known as loyalty)? Let's pretend that you want to launch a new product. You have something clever, creative, innovative, and you want to share it with your customer base. What is your first instinct? In other words, which marketing vehicle first comes to mind when thinking about sharing this new product with your customers? The homepage on your website. Let's think about the audience. Which audience represents your first instinct? Those who have never purchased from your business. I am willing to bet that your first instinct is to use a catalog spread to communicate new product to the best customers. You've been trained to do this, because it costs $$$ to create a catalog spread, then to pay for print/postage/paper to deliver the catalog spread to a customer. Because it costs $$$ to do this, you cannot take risks, you need to deliver a return on investment. So you only focus on your best customers. That style of thinking was necessary in 1995. That style of thinking can be altered in 2010. You have countless tools (e-mail, homepage, Facebook, Twitter, Mobile) to deliver your message to all audiences, essentially for free. Now, granted, you may not have a customer audience that appreciates all of these new channels. That shouldn't stop you from trying to develop the new channels. 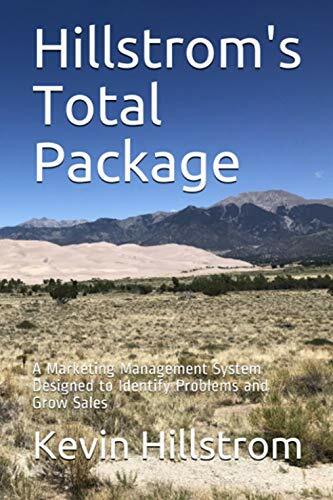 If your catalog goes to 500,000 households and you have an e-mail list of 750,000 and you have a new product that will only be profitable if mailed to 200,000 households, give the new product launch a shot via e-mail ... make it the focus of a half-dozen e-mail campaigns over the course of a month, as an example. Or develop a story about the product that you can share via your website, Facebook, Twitter, Ning, you name it. This is a good time to experiment. Costs are low. Risks are low. Abt Electronics has a page featuring items that you can pre-order, items that are not yet available. This is yet another e-commerce tactic that is under-utilized ... there's nothing wrong with "priming the pump", if you will. What are examples of brands that you think do a good job of building anticipation for new merchandise? Go to Google, and type the following search term "Urban Outfitters Mens Shirt". Click on the natural search Urban Outfitters Mens Clothing - Shirts link. Then click on the Salt Valley Solid Dobby Roll-Up Western shirt. Finally, click on the Trends link on the upper right hand portion of the page. Scroll down to the bottom of the page. If you are lucky, you'll see that you viewed the Salt Valley Solid Dobby Roll-Up Western shirt. There are clean ways to display to customers what they've previously viewed. This is one example. Also notice that items have reviews, and you can ask a question about any item from the item landing page. Also notice that Urban Outfitters actively promotes the Catalog, Blog, Facebook, Twitter, Text Messages, and Daily RSS Updates. You pick the version of communication that works best for you. Again, I'm not advocating that this works or does not work. Instead, I'm asking you if there is a version of this that is appropriate for the business that you manage. Did you know that eBay generated $8.7 billion in sales last year? Did you know that eBay generated $0.6 billion in mobile sales last year? Did you know that eBay is expecting to generate $1.5 billion in mobile sales this year (see Get Elastic and eBay). Hint: You are beaten over the head by Social Media, a craft that, outside of personal brands, has a hard time demonstrating that even 1% of sales can be tracked to it. You're being told that "print isn't dead", even though print-based sales have been in decline for a decade. And then there is mobile, which gets talked about a lot in the tech world but not much in marketing circles. And you can generate sales, easily measured sales. My job, of course, is to measure whether mobile sales are incremental, or whether they cannibalize traditional e-commerce. That's fun stuff, because $1.5 billion in measured sales can be $0.2 billion in incremental sales --- nobody talks about that, or the ramifications of outcomes like that. Regardless whether the sales are incremental or cannibalized, it's obvious that every company I work with needs a mobile strategy. Via PKSF, here's a web channel called "Fashionair", one that takes you in to the world of fashion, with obvious applications to the folks at Saks or Neiman Marcus or Nordstrom. Again, I'm not saying this stuff will or will not work. But there must be some version of this that is relevant in the industry you work in, some version of this you can experiment with, right? One of the logical ways to leverage Digital Profiles is within the context of merchandise analysis. Loyalists: Customers who have been with you forever, they just keep shopping, year after year after year. Sale Shoppers: These customers are loyal as long as you offer them discounts, promotions, incentives, buy one get one free, gift with purchase, you name it. Gift Givers: These buyers skew their dollars to the Holiday timeframe, though they do shop on an infrequent basis during the remainder of the year. Infrequents: Customers who do not exhibit regular or predictable purchase behavior. Ok. Now, pretend you are Apple, and you want to understand who purchased different items. Beats Headphones from Dr. Dre. You segment your customer base as of April 1, and then for the past two weeks, you analyze merchandise sales by Digital Profile. Remember, this data is made up for illustrative purposes. You can see that each item entices a different composition of Digital Profiles. The iPad is craved by Loyalists, the iPod Classic is desired by sale shoppers (as the price slowly drops over time) and first time buyers, the Beats Headphone is strongly preferred by the infrequent or new shopper. Knowing the customers that prefer each item allows you, the marketer, to customize your digital marketing activities. If you were sending an e-mail campaign to your loyal customer base, you probably wouldn't focus on the iPod Classic. If you were sending an e-mail campaign to infrequent shoppers, you might want to focus your efforts around the Beats Headphone. Digital Profiles represent a logical way to segment and analyze your customer base. If you had a new, fancy tool like Webtrends Segments, you'd absolutely love having Digital Profiles as part of your data warehouse. If you need help creating Digital Profiles, please contact me. You continually mention three trends to me. It is becoming really hard to acquire customers via print. It is becoming really hard to reactivate any customer not considered a "best" customer. Customers acquired via online marketing have worse lifetime value than do other customers. That's a dilly of a pickle, isn't it? Granted, the Great Recession hurt many businesses. But put that aside. The trends you communicate to me have been firmly in place since 2005. Our industry got a five or ten or fifteen point boost by switching from list vendors to the co-ops, and that helped mask a disturbing trend for awhile. Now, there's no avoiding the problem. One Executive called it the "Erosion of the Bottom". In other words, the infrequent shoppers that we used to count on for one purchase a year are disappearing, and cannot be replaced using traditional catalog marketing strategies. I like to think about the problem this way. Back in 1995, you had a checkerboard, with three stacks of four checkers in one corner. These stacks represented various prospect audiences. Each stack represented a mass audience, and it was easy to target the mass audience ... with a catalog! In the past fifteen years, we lost four of the twelve checkers. Four of the checkers moved to their own, individual squares on the checkerboard. Some shop with online brands. Some spend their money on the iPhone and are enthralled with apps. Some grow crops on FarmVille. Some have 388 followers on Twitter. All spend a lot less time with traditional marketing channels than they used to spend. Today, four checkers moved to other parts of the board. Three years from now, it will be six checkers, not four. Take Ning, the social networking platform. You have 40,000,000 users on Ning. Think about that number for a moment, let it sink in ... 40,000,000. Of course, there are a million networks on Ning. This means that the average network hosts 40 users. Pretend you wanted to reach all 40,000,000 users on Ning ... heck, pretend you wanted to reach 50,000 users who have an affinity for what you have to offer. You simply cannot rent a list and toss a catalog in their mailbox, that's old school, easy marketing, those days are gone. What is happening is that we're seeing the slow, steady, inevitable erosion of a mass audience that could be reached via mass marketing tools like list rental and catalogs. A percentage of our prospective customers are dispersing into an infinite combination of preferences, and as a result, cannot be targeted in an efficient manner using traditional techniques. "If I can't reach a mass audience with catalogs anymore, show me the three or four tactics I can use to replace catalog marketing with while not losing sales." This is where the discussion ends. Because there aren't three or four tactics that you can use to replace catalog marketing with. E-mail pundits thought that e-mail marketing would supplant catalogs. It didn't. Paid Search and Natural Search cannot supplant catalogs. Banner Ads and Affiliate Marketing cannot supplant catalogs. Being "multichannel" turned out to offer us essentially nothing, in terms of incremental growth. And you can try to copy what Zappos did, but it probably won't work for you. We're in a unique place in history. What we've always done is slowly dying, and there is nothing new that scales so that we can replace what we've always done. We have to invent the future. We need to reduce our catalog marketing budgets by 20% (by cutting circ from segments that no longer shop via catalog marketing), and then re-invest that money in other tactics, realizing that 19 of the 20 tactics we try will fail. Of course, if we don't do this, then we fail at 20 out of 20 tactics. You've been here before. You had 1-800 numbers and credit cards. You had the advent of the internet. You had the advent of search marketing. You're now experiencing the advent of mobile and social and tablet devices. Each time in the past, you adapted, you changed with the times. This time, we get to invent the future. Toys "R" Us offers you a widget that offers special deals, available via desktop, web, or iPhone (sort of like the classic multichannel phone/web/store concept, just more modern). Take a look at the landing page (click here). Is there a version of this that is appropriate for your business? If you are passionate about attributing orders to the advertising vehicle that drove them (we've been talking about catalog matchbacks for a few days ... the online folks have lots of channels to figure out! ), then give this a read from the good folks at The Rimm-Kaufman Group. As you already know, my Multichannel Forensics and Online Marketing Simulations look "forward" --- given what a customer did in the past, how is the customer likely to evolve over the next five years? With my forward-looking approach, you get to see the future impact of converting a catalog shopper to an e-mail shopper, or converting a search buyer to an affiliate buyer. Many of your attribution issues look "back" in time, where you try to tie a response to a series of marketing activities. If that's what you are looking for, given their solution a try! I met with George Michie last week to discuss their application, and have exchanged e-mails over the past two months on the topic. I do believe that what they are trying to accomplish is a good complement to your catalog matchbacks, and to the work that I do, or I wouldn't support their efforts. Yesterday, we talked about why matchback programs for housefile circulation can be considered a "worst practice" if matchbacks take credit for orders that are not incremental, orders that would have happened regardless of a catalog mailing. Always remember, I advocate matchbacks for customer acquisition activities. I recommend mail/holdout tests for housefile names. Matchbacks, in and of themselves, are not evil. How your vendor chooses to apply matchbacks to your business can result in a worst practice. I am not saying you shouldn't do matchbacks. I am saying you should apply them correctly, not in the fashion that some in the vendor community recommend. Today, we'll briefly chat about the methodology I use, strongly influenced by mail/holdout results, with some matchback information folded in, to determine the optimal number of catalog contacts a customer should receive in a year. Here's my goal for you. My goal is to reduce your housefile catalog marketing advertising expense by about 20% while losing less than 5% of your sales. My goal is for you to take this money, and re-invest it in catalog customer acquisition (even if at a loss, because that will be more profitable for you than the 27th catalog to an existing customer this year), e-mail marketing, paid search, affiliate marketing, other online marketing, mobile marketing, social marketing, or to have you simply pocket the extra profit. That's what I'm trying to do for you. Ok then, here's the methodology that I use. 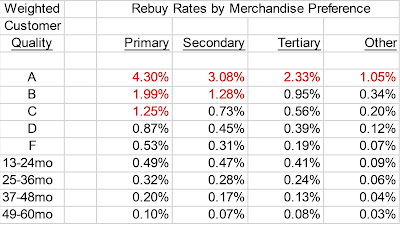 Step 1: Model The Likelihood Of Annual Repurchase. I build a Logistic Regression model that predicts the probability of a customer buying again in the next twelve months. Let's pretend that the likelihood is 30%. Step 2: Model The Amount A Customer Will Spend, Annually, If The Customer Repurchases. This is a Ordinary Least Squares Regression model that calculates annual spend. Let's pretend that the amount is $150. Step 3: Multiply Step 1 by Step 2. This yields the predicted demand amount expected of each customer. In our example, this is 0.30 * $160 = $48.00. Step 4: Calculate The Organic Percentage. This is my proprietary trick. I use Digital Profiles, mail/holdout results, some matchback information, Multichannel Forensics data, and a series of slick tricks to calculate the percentage of demand that a customer will spend if the customer does not receive one single catalog all year long. This is where all of the magic happens! In our example, let's pretend that the percentage is 75% ... meaning that if we don't mail a single catalog all year, the customer will spend $48.00 * 0.75% = $36.00. If the customer spends $36.00 organically, that means the customer will only spend $12.00 because catalogs are mailed. If you have mail/holdout testing, a better practice than matchback programs, I fully incorporate the results of mail/holdout tests in this step. Step 5: Simulate The Profitability Of "X" Catalogs. More magic happens here. I use a "power curve", often derived from mail/holdout tests, but if you don't have a mail/holdout test, I've got a few tricks at my disposal. I create a table that illustrates what will happen at different contact frequencies --- it turns out that customers will shop on their own without the need to receive a lot of catalogs, and they will shop increasingly on their own as the number of contacts are reduced. Therefore, we simply need to find the number of contacts that yields the maximum level of profitability. In the table below, the optimal strategy happens when you mail just two catalogs --- clearly, this customer will continue to spend money if catalogs aren't mailed. This, Catalog Executives, is what I do. I combine a few tricks, take some common-sense methods, and end up with a clever way to save you 20% or 25% of your budget dollars while losing a very small percentage of your demand, causing you to be much more profitable. Hint --- this methodology tends to be more accurate and generates more profit than using matchback methodology to evaluate how many catalogs to mail to housefile segments. This type of project is very popular in 2010 --- so if you want in on the excitement, please contact me for details! Sometimes, we need to look again at an old concept, to see if it is still viable. Today, the concept is the "matchback". This is the catalog process where online orders over, say, a sixty day window, are "matched back" to the customers who received a catalog. The assumption is that when a customer orders online, the customer orders because something stimulated her to order. More often than not, the cataloger believes that the catalog caused the order. The best way to validate whether matchback results are accurate or not is to execute mail and holdout tests. Take your house list of 200,000 twelve month buyers, randomly sample 40,000 names, then split those names into two groups. One group receives your next catalog, one does not receive your next catalog. Mailed Group Online Demand = $4.00 per customer. Holdout Group Online Demand = $0.20 per customer. When you observe this outcome, you know that catalog matchbacks represent a "best practice" for your business --- online orders simply would not happen if the catalog is not mailed. Holdout Group Online Demand = $3.00 per customer. When you observe this outcome, it means that your matchback algorithm is taking credit for all of your online orders, when in reality, 75% ($3.00 / $4.00) of the orders would happen anyway, regardless whether the catalog was mailed. In this situation, catalog matchbacks are a "worst practice". They are causing you to dramatically over-mail your customer file, matchbacks may be costing you 15% to 50% of company profitability. I mean it. That is what happens! I analyze a lot of customer data across a lot of companies. I see this on a routine basis. Long-time readers are looking at this and are saying "... Kevin, you've been harping on this topic for more than four years, when are you going to stop?" Well, I'll stop when we, as an industry, begin to avoid "worst practices". I want your business to be highly profitable. I don't want for you to waste money on cataloging, when you could save that money and re-invest it in customer acquisition or re-invest it testing new methodologies or new technologies. Execute a test. Determine for yourself if you are executing "best practices" or "worst practices". As you know, in the next 1-2 months, I will publish the first year of Gliebers Dresses articles. You will be able to read each post, you'll read the farewell address from Glenn Glieber, and you will get to read my thoughts about each of the major characters in the story. Going forward, I will continue to share with you some of the things that are happening at Gliebers Dresses. As you already know, when a new ownership team takes over, things change. Setting: As usual, I am about to Skype in to the Gliebers Dresses Executive Meeting. It is April, so this is the first meeting being run by the new CEO, Brendan Templeton, the whiz-kid who built Zeldies into a billion dollar handbag business that delivered questionable profitability. Here we go. I enter the meeting. Meredith Thompson (Chief Merchandising Officer): "So Kevin, welcome, we're waiting for Brendan to arrive. I was just telling everybody how nice it was to see Glenn yesterday. Ok, here comes Brendan." Brendan Templeton arrives in the board room. He appears to be the opposite of a presence that is larger than life. He's maybe five foot eight inches tall, he's slender, with thin, dusty brown hair. Brendan Templeton (Chief Executive Officer): "Dudes, thanks for being here today. I understand you have a weekly meeting, for now, I'd like to honor the weekly meeting. So, why don't we get started." Pepper Morgan (Chief Marketing Officer): "Let's review the numbers from last week. The catalog business was up eight percent from last year, and was up twelve percent to plan ... "
Brendan Templeton: "So let's see if I understand what happened, your catalog was better than last year, and was even better than your plan. Does that mean you sandbagged your plan so that you'd make your numbers?" Pepper Morgan: "We were conservative, we didn't want to be aggressive and then be stuck having to liquidate merchandise if we missed plan." Roger Morgan (Chief Operating Officer): "In catalog marketing, you want to make sure you have too much inventory. Inventory ages, it is like a red pepper, it gets worse every day it sits there." Brendan Templeton: "You mentioned that catalog performed well. Is that the business the catalog drives to the website?" Pepper Morgan: "Oh no, catalog refers to the amount of business driven to the telephone. Online, we hit plan, and were flat to last year." Brendan Templeton: "Something like 75% of the business happens online, right dude?" Roger Morgan: "Here name is Pepper." Lois Gladstone (Chief Financial Officer): "Yes, we generate three-fourths of our volume online." But we like to focus on catalog, because catalog drives our business." Brendan Templeton: "Ok, what was the conversion rate of shoppers who came from your catalog?" Pepper Morgan: "Gosh, I have no idea. How would we even measure that?" Brendan Templeton: "Put that on your list. We want to split our online audience into pieces. We want to know the online shoppers who came from catalog, and we want to segment them from search visitors or e-mail visitors or affiliate visitors, right dudes?" Pepper Morgan: "And we do that, for the most part." Brendan Templeton: "Good. So from now on, when we report morning numbers, we're not going to focus on the physical channels like telephone and online, we're going to focus on the effectiveness of the advertising channels that drove demand." Meredith Thompson: "Wow. That's not how we're used to looking at the business. We like to look at phone orders and online orders, so that we can see the evolution of the customer from phone to online." Brendan Templeton: "Dude, do report on demand from Visa compared with PayPal?" Meredith Thompson: "Well no, that's not really actionable." Brendan Templeton: "Right. Going forward, telephone demand is not an actionable metric. It's only 25% of our total volume, and will continue to be less and less of our total over time. And I don't care how the customer shops. If she wants to order over the phone, God love her, dude. If she wants to order online, dandy. If she wants to stop shopping via search, that's something I want to know about, because I can do something about that." Roger Morgan: "I don't think we've ever talked about search demand in these meetings. We're a multichannel business, and the catalog is the foundation of a solid catalog business. Just ask Woodside Research. Would you like for me to hook you up with those folks? They've done a lot of research on the topic of multichannel marketing, and print is everything, print is what drives a multichannel business. Just ask them." Brendan Templeton: "Dude, at Zeldies, we grew to a billion dollars without ever sending one single piece of print in the mail. Would you rather have Gliebers Dresses be a billion dollar business without print, or a forty-five million dollar business with catalogs?" Meredith Thompson: "Do you think we can be a billion dollar business without print?" Brendan Templeton: "Dude, tell me this. How many customers were delivered your e-mail campaign last Thursday, how many clicked-through to the website, how many ordered something, and how many ordered merchandise not featured in the e-mail campaign?" Meredith Thompson: "I don't know, I don't have the report in front of me. I'm not even sure I've ever seen the report." Brendan Templeton: "Ok Dude, now tell me how the merchandise on pages 18-19 performed in the March catalog." Meredith Thompson: "That's easy, I have the metrics right in front of me, see, the ..."
Brendan Templeton: "Hold it dude, you nailed my point. We can't have a billion dollar business without print if we don't know anything about the non-print portion of our business." Pepper Morgan: "That might be the first profound thing mentioned in this room in the past six months." Brendan Templeton: "That's a rockin' comment, Pepper. Dudes, here's the 411 ... I may not ask you how a single catalog performed over the next week. I'm going to focus my efforts on what you're doing to drive us to the future. I'm going to focus my efforts on the metrics that allow us to grow our business outside of print. You're all print experts. So, right on, man, you're going to continue to do what you do well, I can't improve on that. But I will make us focus on everything else, the intersection between the past and the future, dudes." Brendan Templeton: "So let's start with my first gift to you. In your office, as we speak, my new administrative assistant, Amber, dropped off a brand new iPad on your desk. Here's what I'm looking for. Use the device for a week. Use some apps, given things a try. On May 1, I want to know what our iPad strategy is. I want a project outline that clearly communicates the launch date for our iPad strategy. How do each of you apply your catalog knowledge into the framework of an iPad. It seems to me that flipping through a digital catalog with your index finger on an iPad is a logical extension of the Gliebers Dresses brand. So go make something happen. I'm looking forward to what you come up with, by May 1." Roger Morgan: "Oh Mr. Templeton, maybe you're not aware of this, but we have a thing called a 'Book of Work' that we use to prioritize our projects. We'll have to evaluate your ideas with the actionable items in this book of work." Brendan Templeton: "Dude, launch this rocket up to the top of your book of work. Now go make something happen, dudes. I'm outta here!" Meredith Thompson: "This is going to be interesting. Kevin. do you have anything to say?" Kevin: "Nope, I think Mr. Templeton is setting a good precedent, thanks everybody." Dear Catalog CEOs: But That's Not How I Shop! I get a lot of feedback from all of you. And lately, the feedback is directed toward how customers shop. Our discussions begin with the "target" customer. She (or he) is a 45-64 year old customer. We believe the story that we've been told by industry leadership, that all of these customers love receiving catalogs in the mailbox, they sit down next to the fireplace on a winter evening and get cozy with their favorite catalogs (or they do this at a restaurant ... I watched a couple in their mid 60s wait for their dinner by thumbing through catalogs a few weeks ago). Then there is another customer. This customer, probably younger than 45 but not necessarily younger than 45, approaches her craft in a different manner. Maybe she loves all of the promos in your e-mail marketing activities. Maybe she can't remember your URL so she punches it into Google and you pay Google $0.50 for the right to direct her to your website. Maybe she loves to comparison shop, and uses Google to have five tabs open at the same time, with product from your competitors being synthesized while she evaluates your offering. Maybe her friend from church posted on Facebook that your brand has wonderful merchandise, so she decided to visit your website. This customer does not shop via catalogs, she simply behaves in a manner that isn't congruent with the classic catalog shopping experience. She uses technology to make choices. Whether you mail a catalog to her or not is largely irrelevant to her. Your matchback program grossly overstates catalog performance when analyzing this customer, benefiting all of your vendors but costing you profit. "But that's not how I shop!" Once this declaration is issued, the conversation shifts. We're now talking about the way you, the CEO, like to shop. You like catalog shopping, don't you?! Because you understand the way you shop, because you don't understand the way this "other" customer shops, you sometimes make an assumption. You assume that your customers are like you, and aren't like her. Maybe the majority (i.e. 60%) of your customers are like you. The problem, of course, is that the percentage of customers who do not shop the way you like to shop grows, every single day. Technology and Demographics are transforming what marketing and websites and retail mean to customers. You see this in your customer acquisition results. 70% of you tell me that it is becoming very difficult to acquire customers anymore via your co-ops or your favorite list organization. You show me metrics that suggest response is falling off of a cliff. That's because 40% of the target audience no longer shops the way that you like to shop. Ten years ago, that number was 5%, so it didn't make any difference. Today, this fact is slowly killing your business. Here's a fun exercise. Go to your call center, and pull yourself a focus group of nine individuals under the age of 40. Ask these fine employees who they like to shop with. Then ask these employees how the prefer to "interact" with the brands the like to shop with. Ask them what caused them to place their last order with their favorite brands. Then sit down with your Marketing Executive, and share the results of your informal focus group. Ask the Marketing Executive to build a marketing plan for 2011 that incorporates the things you heard mentioned by your informal focus group. And then, you're going to ask me to work on a project with you. We'll use Digital Profiles, Multichannel Forensics, and Online Marketing Simulations to filter your audience into three groups. Those who love to shop via catalogs, requiring catalogs to continue to shop. Those who are the fabled "multichannel" customer audience, customers who can receive a reduction in contacts without damaging the top line. Those who "do not shop like you shop"! These customers require a modern marketing strategy, and can receive far fewer catalogs without damaging the top line. You may not like what you learn when conducing an analysis of this nature. I'm guessing you would like a significant increase in profitability, right? The MineThatData Blog Has A New URL! My blog is now located at http://blog.minethatdata.com/. If you are visiting http://minethatdata.com/blog, you will be automatically redirected in 30 seconds, or you may click here. Feed subscribers, please make sure that your subscriptions always point to http://feeds2.feedburner.com/MineThatData. Maybe more important than the earning summary (click here to read the earnings transcript) is the way the first two pages of the document read. Could you, the Business Executive, write two pages that clearly articulate why your business was successful in 2009 and then map out with passion and ease where you are taking your business in 2010?